In a medium pot of salted boiling water, cook brown rice pasta according to package instructions. Drain well and set aside when done. To avoid sticking while the remaining ingredients are cooked, toss with 1 tablespoon of olive oil. In a large skillet or Dutch Oven (capable of containing the entire bunch of shredded kale), cook bacon according to package instructions, until crispy. Remove bacon from pan and set aside. Chop the bacon into small bits when cool enough to do so. Remove additional liquid grease from the pan, though it should be minimal if you are using turkey bacon. You can use the same pan to sauté onions and kale. Heat 2 tablespoons of olive oil over medium heat in the same deep skillet or Dutch Oven. Add onions and cook for about 4 minutes, until they start to turn translucent, stirring occasionally. Add the kale and 1/2 teaspoon each of salt and pepper. Stir until kale begins to wilt, about 2 minutes. Add chicken broth, and continue to cook until all the kale is wilted and most of the chicken broth is absorbed by the kale, about 5 minutes. Remove from heat and set aside. In a large mixing bowl, combine greek yogurt, egg, mozzarella cheese, 1/4 cup cheddar cheese, milk, red chili pepper flakes, Ranch seasoning, salt and pepper. Mix until well combined. To the kale sauté pan, add chicken, bacon bits, cooked pasta and mix with the kale and onions until evenly distributed. This will help the pasta soak up the rest of the chicken broth remaining in the pan. 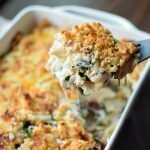 In a 9×13 greased casserole dish, layer each component of the casserole starting with the kale noodle mixture. Place half of the kale noodle mixture evenly in the casserole dish. Next, place about half of the custard mixture on top of the kale noodle mixture using a large spoon or utensil to spread evenly over the noodles. Repeat the process once more, until all custard and noodle mixtures are gone. Bake for 20-25 minutes until the top is melty and golden brown. I like to broil for an extra 3 minutes for that crisp top! PREP: The chicken can pulled a day ahead of time, or pre-cooked if you are using chicken breast. I’ve also made the bacon for this recipe ahead of time when I was cooking bacon for breakfast. Store in an airtight container or Pyrex dishes.